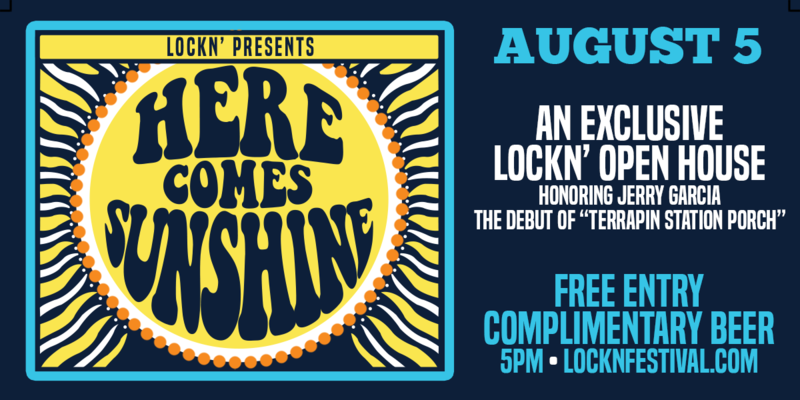 You’re invited to join us for a free, invitation-only preview of LOCKN’s new and improved festival site. Be one of the first to explore our new festival experience at this exclusive event. We’re throwing a party at Infinity Downs Farm, the home of LOCKN’, on Saturday, August 5, debuting the new upgrades to LOCKN’ designed to enhance your comfort and convenience. The new changes to LOCKN’ will increase the quality of each patrons experience and we can’t wait to share this next-level site with you. We’ll be unveiling – for the first time ever – our replica of Terrapin Station, and dancing the night away to a screening of Jerry Garcia Band Live at Shoreline (9/1/90) in high-definition and full-concert-sound. Hosted during “The Days Between,” Jerry Garcia’s birth and the anniversary of his passing, this exclusive celebration will feature access to miles of LOCKN’s bike trails, COMPLIMENTARY BEER, food trucks, a guitar pull, and hay ride tours of the new LOCKN’ 2017 festival site. Few artists in history have symbolized community, embodied energy, and brought free-spirited music to the world, like Jerry Garcia. Our tribe is a testament to the power of dreams and the freedom of live music. So many roads have connected us all to one another, and our hearts are full of wonder, and our souls are deep with dreams. We hope you’ll join us to experience a powerful expression of music, dance, and song. Let’s honor Jerry and remind ourselves how incredible this life really is. This is your chance to witness magic. We hope you will join us for something truly special, for it’s such a long long time to be gone and a short time to be there.